Around Stirling there are lots of places to go for a day out in the surrounding countryside. If you only have a an hour or two, there are plenty of short Stirling walks on your doorstep. In Stirling you are spoiled for choice. Scenic walks, hill walks, country walks, cliff top paths, woodland and waterfall walks, the ghost walk and walks around Strling Castle and the Wallace monument. A gentle stroll or a steeper climb? Find the walk that is right for you. There's so much to discover on The Abbey Craig. Take things at your own pace and Whether you want to enjoy a brisk walk up to the Wallace Monument or take a relaxing ramble through the woods, you will find a route that is suited to you. 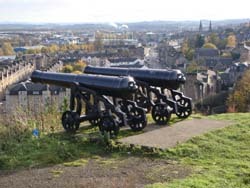 Take this lovely scenic walk around Stirling Castle, the old town walls of Stirling, the Back Walk and the Gowan hill. Wonderful views over to the Campsie Fells, Ben Lomond, Ben Ledi, Stuc a'Chroin and Ben Vorlich. The Stirling Ghostwalk is a spooky guided tour of Stirling's historic old town, mixing drama, comedy and storytelling. Meet Jock Rankin - the Happy Hangman0, Blind Alick Lyon, Auld Staney Breeks, the Green Lady and a host of other worthies and weirdies. By the banks of the River Allan. Starting in Bridge of Allan, follow the Glen Road all the way to Dunblane. a well marked path and one of the finest country walks near Stirling. The Mine Wood was formerly owned by the Westerton Estate and was purchased by Bridge of Allan Burgh Council to commemorate the coronation of Queen Elizabeth II. The network of paths which run through the wood were laid out in the mid 19th Century. A beautiful mixed woodland walk. A beautiful walk at any time of year. Follow a circular route from Bridge of Allan, walking to Dunblane then retrace your route or catch a train back to Bridge of Allan. Close to Stirling University. Starting from Logie church car park, you should be able to complete this circular walk in an hour and a half or make it a shorter circuit by making your way down through the Hermitage Wood and returning along Back o' Dykes. The Hermitage woods are a good spot for a short stroll or as part of a longer walk up to Sherrifmuir or Dumyat. The woods back on to the grounds of Stirling University which is sited on the old Airthrey estate. The dense, mixed woodland is rich with plants, wild flowers and wildlife. This is an easy walk from the city centre. You could probably cover the route in an hour and a half but take your time and enjoy the park and views. Great views over the Carse and to Stirling castle with the Ochil Hills beyond. The banks are steep in places and you will have to clamber over fallen trees, rocks and dense undergrowth. There isn't a path to follow and the burn is relatively narrow so, you will find it necessary to keep switching between the banks. 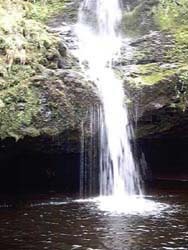 Explore Gilmour's Linn on the Cambusbarron to Touch Waterfall Walk. This is a great walk to take from the centre of Stirling. Allow a few hours to complete the full circuit, especially if you intend to spend some time at Cambuskenneth Abbey and the Wallace Monument. Start from the village of Gargunnock 10km west of Stirling. You can walk this route for 2miles/3.5km to view Downie's Loup or alternatively, follow a longer route Under the Craigs 4.5miles/7km. This route takes you along one of the finest cliff top paths in Central Scotland, above the North Third reservoir. On a clear day you can see Ben Ledi, Ben Vorlich, Ben Chonzie, the Ochils, The Lomond Hills the Forth bridges, the Pentland Hills and Meikle Bin in the Campsies. Map showing the location of the best woodland walks around the Stirling area. 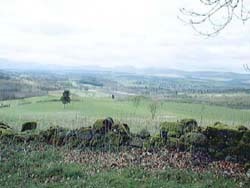 Rolling braes and grassy ridges in the North and a steep drop to the plain of the Forth in the South. A product of the cataclysmic Ochil Fault, the Ochil hills extend some 20km behind the Hillfoots towns and villages. There are some spectacular walks in the Ochil Hills. You can find spectacular waterfalls all around the Stirling area. A few well known ones are listed. The number of visitors to Balquhidder Glen has increased in recent years, due to interest in the life of Rob Roy MacGregor. There are pleasant, short walks and walks for the more ambitious. 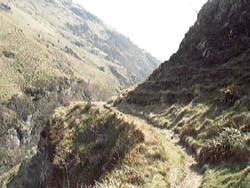 Take the Doon Hill Fairy Walk in the footsteps of Reverend Robert Kirk. Forest Enterprise have marked out a short walk through mixed Oak and coniferous woodland.